You must be wondering, an article on the Jharkhand elections now? One month after the results have been announced? 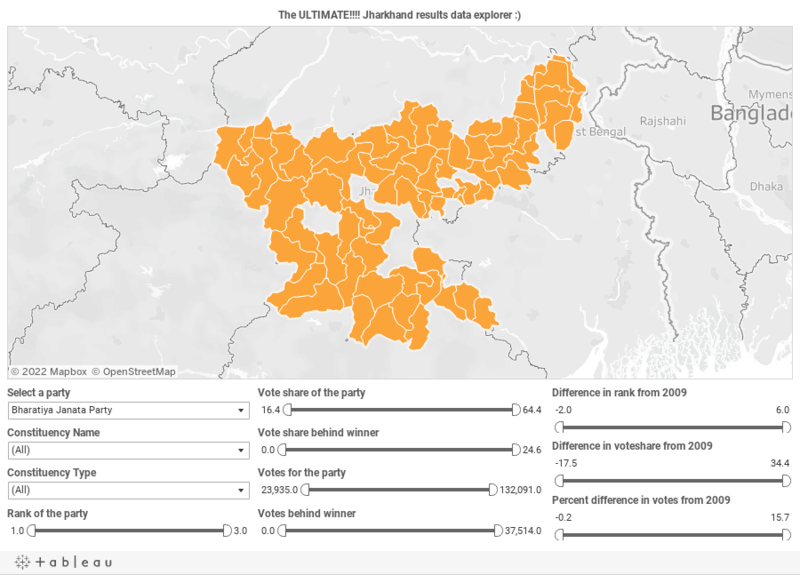 I know, I know, it’s just that I've had this dataset on the Jharkhand elections lying with me for a while, and it’s hard for me to move on to anything else till I’ve analysed this in some way! One of the things I'm most interested in finding out was which seats were the ones that decided the elections, if that's possible. Don't know, guess I was doing it out of some journalistic need to reduce the election results to “10 seats that made the difference". I'll be going a little beyond which party won how many seats, but if you want to refresh your memory of what happened, you can look at the chart above, but like I said, I’ll be going a lot deeper. Anyway, let's dive into the data and see if there are any trends/patterns worth pointing out. 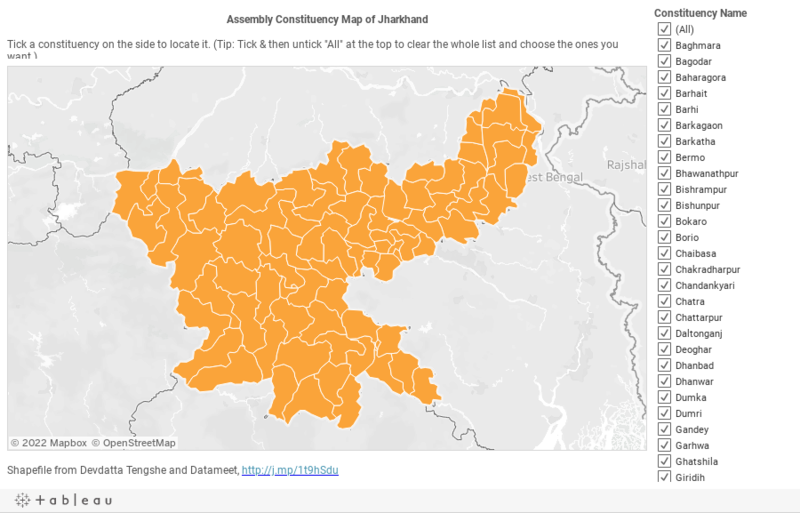 Guess I should probably start off with a constituency map of Jharkhand, so that if I mention a constituency such as Lohardaga that you've never heard of, you can at least geographically place it. So if you want to figure out where the election was won and lost, how do you decide which seats matter more than others? I guess the first thing you'd say is if the race for a particular seat was close, that seat probably mattered more. In the sense that it is a seat that could have gone to any of the competing parties, and the fact that it went to, say the BJP, probably made a difference to the final outcome of the elections. If we look at the parties that were runners-up in those seats and which could potentially have overtaken the BJP, Jharkhand Mukti Morcha (JMM) were runners-up in nine of them, namely Rajmahal, Borio, Sisai, Gumla, Dumka, Ghatshila, Potka, Madhupur, Giridih. 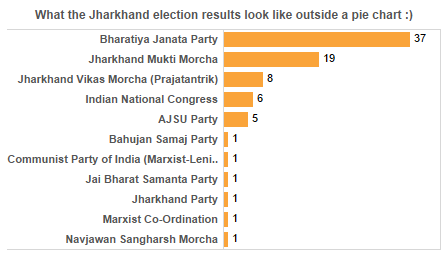 If we consider the BJP's alliance partner All-Jharkhand Students Union (AJSU), of the five seats it won, two were won with margins less than 10K votes, and in one of them—Tundi—the runner-up was JMM. 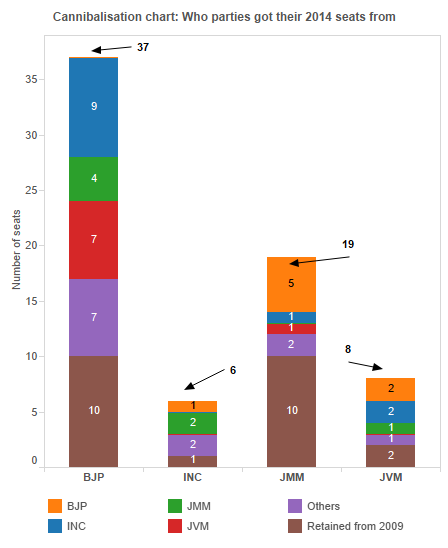 So if the BJP had lost those 9 seats and AJSU had lost Tundi to the runners-up JMM, the BJP-AJSU alliance probably wouldn't have had the majority it does now. The alliance would have gone down 10 seats from 42 at present to 32. On the other hand, JMM would have gone up ten seats from 19 to 29 and become the single largest party with 1 seat more than the BJP's reduced tally of 28. What would especially hurt JMM about this is that five of those 10 seats (Borio, Tundi, Dumka, Ghatshila, Madhupur) were ones that it had won in 2009. 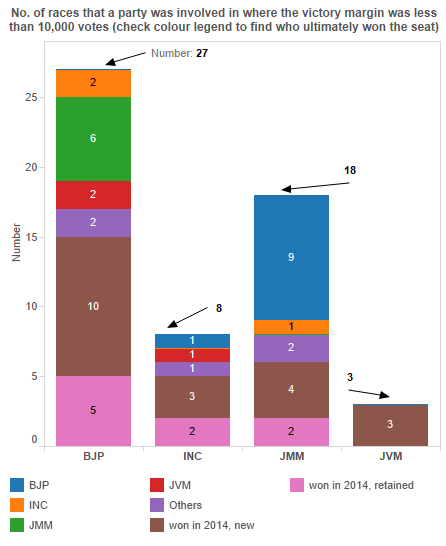 The BJP though was no better than the JMM in retaining seats that were won in 2009. Each of those parties retained only 10 of the 18 seats they won last time. In fact, of the 81 Jharkhand assembly seats in 2009, only 29 seats or 36% were retained by the same party in 2014. Here's a look at each party’s seats in 2014 with a colour legend to show which party had won those respective seats in 2009. The Congress (I) retained just one of the 14 seats it won last time (Barkagaon) and JVM retained only two of the 11 seats it won in 2009 (Simaria, Poreyahat). 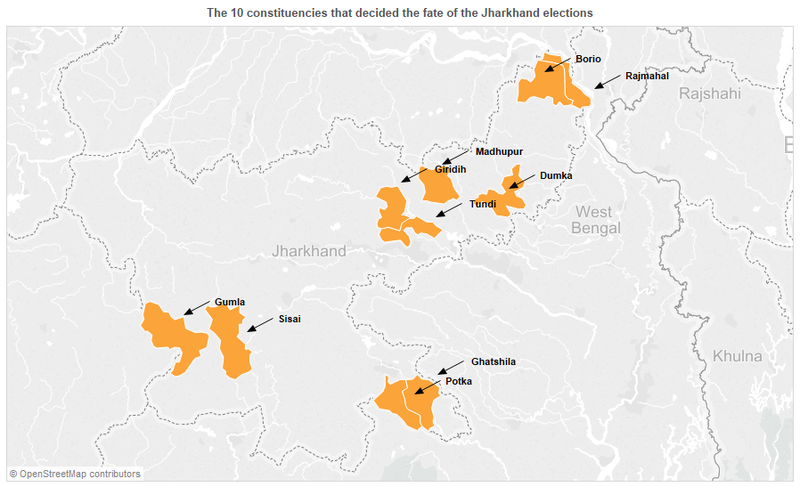 I haven’t checked the all-India or historic figures for whether an incumbent party or candidate is favoured or not, so in that context, I can’t really say whether poor seat retention in Jharkhand should be that much of a surprise to us or not. 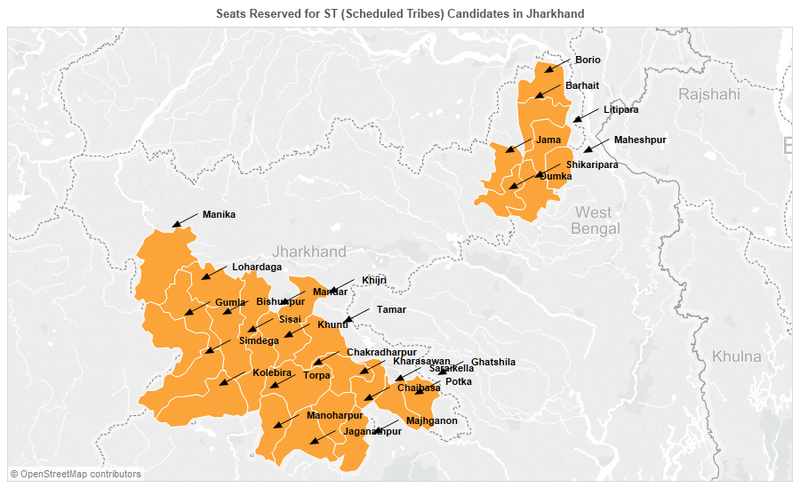 28 of the 81 legislative seats in Jharkhand, around 35%, are reserved for ST candidates, which is the largest percentage of assembly seats reserved for ST candidates outside the North-east. So given how important they are, I wanted to see how the parties performed specifically in these ST seats. The 30% figure represents a 6 percentage point increase in vote share for the BJP from 2009 and a 11 percentage point increase for the JMM. And if we look at actual votes, those for JMM more than doubled from 2009 growing by around 110%, while BJP's votes increased by 65%. The sob story for the Congress(I) continued with its vote share in ST seats dropping 7 percentage points and its actual votes dropping 23%. Whether that's due to the party or the candidate having a stronghold there, I don’t know, that’s something only a field reporter or an expert with a better knowledge of Jharkhand will be able to say. So how do we decide if a race is close? A contest where if conditions were slightly different, the result would have easily gone the other way? The point beyond which a strategist in a party’s Ranchi headquarters starts thinking to himself, "That seat’s gone, we shouldn’t have any regrets, we couldn't have done any better. Closing that margin would have needed too much manpower or resources to have been worth it." Indiavotes, the election website from Niticentral has defined it as any contest where the victory margin was less than 5% of the vote share. The thing though is that given the different turnouts in various constituencies, a 5% vote share in terms of actual votes could mean anything from 5,200 votes in Torpa to 13,000 in Bokaro and I wasn't very happy with that much variation. I then decided to define closeness in terms of actual vote margin instead of vote-share margin. Let me explain why. Imagine that there are two seats, A & B, that were decided by margins of 10,000 votes, and the number of people who voted in total (ie. turnout) was 250,000 in A and 500,000 in B. If you're this party strategist in the Ranchi headquarters, would you think that because 10,000 votes in B is a smaller vote share margin, that the race in B isn’t as close as that in A? Never really met any strategists, but I would imagine that their response would be that the races in A & B were equally close, and that both those seats were equally gettable. Meaning that the resources and manpower the party would have to expend in changing the minds of those 10,000 voters in those two seats, in closing that 10,000 vote gap for the next elections, would be the same in A & B. A victory margin of 10,000 votes wouldn't mean that it was a closer race in A than in B just because B had a larger turnout. But it seems the 5% vote share margin is used by a lot of experts, however much I doubt its usefulness, so I decided to give it partial recognition by going for a figure of 10,000 which is close to 5% of the total votes cast in some of the larger turnouts in Jharkhand. I then followed the logic that if you’re allowing for the margin of closeness to be 10K votes in constituencies with larger turnouts, you should allow for 10K votes in constituencies with smaller turnouts too. There’s probably a more statistically-rigorous and scientifically-valid way to go about this. If we get down to it, closeness probably even varies from constituency to constituency. So if you're a social scientist and know of a better way to define closeness, do get in touch! I’ll be surprised if someone hasn’t already come up with some formula that takes into account the number of candidates in a constituency, votes polled for each etc. etc. But given the readership I expect for this article, a figure of 10K should be fine. A look at the histogram or distribution of victory margins will show you how 33 of the 81 seats will be classified as close if we go with the 10,000 vote definition. Taking the idea further that a victory margin of 10,000 seats counts as close, I had a look at those seats where parties were within 10,000 seats of victory. The way I worked this, these figures would include seats not just where runner-up candidates were within 10,000 votes of victory but also seats such as Manika where Congress (I) placed 3rd but were still within 10,000 votes of victory. If a party (a) won all the seats where it was within 10,000 votes of victory and (b) won a seat where there were less than 10,000 votes between it and the runner-up, the chart on the left would be the result. So BJP could have increased its tally by 12 seats if it won the other races where it was within 10,000 votes of victory, six of those seats were ultimately won by JMM. So as I said at the beginning, I’ve actually had this dataset for a month now. The night of Dec. 23, 2014, after the final results were declared, I used kimonolabs (here’s the API I used, though you’ll have to register first to view it.) to scrape the data off the Election Commission’s results site. (Python, one day I will master you and create a web scraper of my own!). It’s been tough getting any free time, so I’ve been working on this Jharkhand article on and off for the past four weeks but finally, it’s done. In keeping with good open data practices, I’ve put a link below to the dataset used. It’s a 9 MB download from Dropbox, would have put it up in Google Docs, but apparently it’s got too many rows to import. :( Note that the dataset has been combined with geographical coordinates in order to map things in Tableau. And finally, here’s a tool I’ve created in Tableau to explore all the data in the dataset. Beware all ye who enter here! If you’ve read this far and want to comment on the article, please do. But Internet, please be nice!